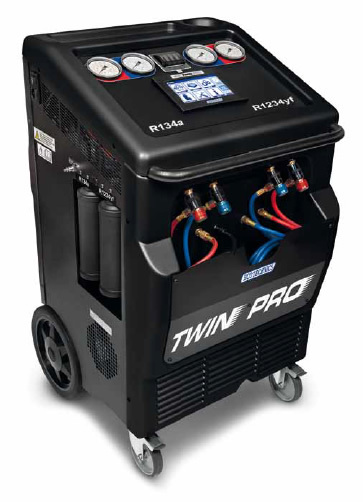 Here at Garage Express we are one of the very few garages in London that have invested in the new 1234YF Air Conditioning Machines. This means we are able to re-gas and service the new 1234YF gas air conditioning systems that are now found in all new cars. Over time your car or van’s air conditioning system will lose a small amount of its refrigerant, typically it can be up to 15%. This loss causes the air conditioning to significantly reduce its capability to cool the interior of your car or van properly. Air conditioning systems that have been looked after and maintained properly not only cool the car or van’s interior, but also reduce air moisture levels and this in turn helps to defog interior windows. In addition, a maintained air conditioning system will help to remove any nasty odours. It is important to realise that the new 1234YF gas has lower greenhouse warming potential than the old air conditioning gas, which means that it is much more environmentally friendly. However, and it is worth noting, the new 1234YF gas is significantly more expensive than the old type of gas. To provide as much clarity as possible with our air conditioning re-gas and maintenance services, we have created a pricing structure that illustrates each of the procedures that are undertaken within the price options. Book your Air Conditioning Re Gas & Service with our quick book form below or call our team on 0208 905 8788. D.Holyland. Fleet Servicing Customer, North London. In my experience, garages don’t often try this hard to please their customers, so I will definitely be back, and in the meantime recommend Garage Express to anyone in need.